The Juneau Animal Rescue sincerely thanks the community for their generosity at JAR’s sixth annual Wine and Beer Tasting. We are especially grateful to the beer and wine vendors that donated to the event, K & L Distributors, Specialty Imports, Alaskan Brewing Company, and Devil’s Club Brewing Company, as well as their volunteer servers. 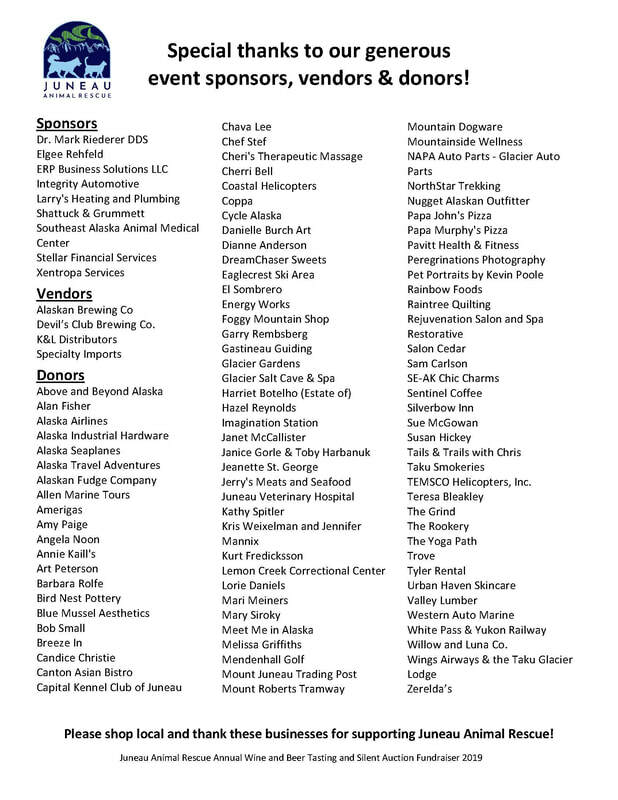 We also appreciate all of the business and individuals that donated to our very successful silent auction. Finally, JAR is grateful to Senator Jesse Kiehl and pianists Tom Locher and Alex Marvel for providing such outstanding entertainment. You all made the event our most successful yet and we are so excited for the additional service we can provide Juneau’s pets because of your continued support of JAR.